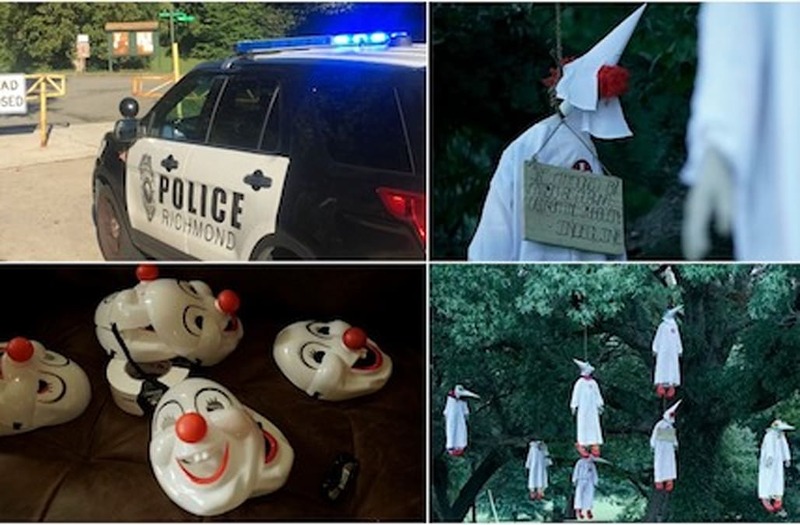 RICHMOND, Va. (WTVR) -- Richmond Police shut down Bryan Park Thursday morning after INDECLINE, an anonymous American Activist Collective, hung “Ku Klux Klowns” from a park tree. It was conceptualized in the Spring of 2017 in protest of the White Nationalist uprising in the United States. The activation was carried out in Richmond, Virginia, chosen for its infamous legacy of being the capitol of the Confederate South. It was executed in what is today known as Joseph Bryan Park, the same location of the Gabriel Prosser slave rebellion in 1800. As part of the demonstration, eight Ku Klux Klan effigies were hung from a single tree. Each effigy wore a "full-body clown costume" under the KKK robe. Each effigy wore a placard that read: "IF ATTACKED BY A MOB OF CLOWNS, GO FOR THE JUGGLER"
The “Ku Klux Klowns” display comes one month after white nationalists, white supremacists, the Ku Klux Klan, and neo-Nazis converged on Charlottesville, Virginia for a "Unite the Right" rally. That rally turned violent when "Unite the Right" demonstrators and those who turned up to protest the rally met face-to-face. Neighbors had mixed reactions to seeing photos of the project. "It's a bit shocking, but it also feels a little bit liberating," Joseph Stephen said. "Good for them." Peg Mohar was turned away by police when she tried to walk her dog St. Lou in the park. "This is very distressing," Mohar said. "I don't feel that my safety has been jeopardized, but certainly civility has been." INDECLINE made headlines last summer when it placed unflattering statues of then candidate Donald Trump in Manhattan, Los Angeles, Seattle, San Francisco, and Cleveland. The park has since reopened.